Here at APT, we’re committed to producing turned parts and CNC milled components of the highest quality. From the design stage, to the production process and the finished product, we ensure your parts and components are made with great care and precision, guaranteeing quality of the highest standard. Quality control is paramount to the way in which we operate here at APT Leicester. All aspects of our manufacturing and production processes are controlled and monitored to comply with the exacting high standards of the AS 9100 and ISO 9001 accreditations we hold. We can confidently assure our customers that the parts we produce are of excellent quality and manufactured to an audited standard. Since the introduction of our Keyence IM-7030T state of the art measuring system, inspection and production times have improved dramatically, subsequently allowing us to produce reports and data such as Statistical Process Control (SPC), something which will benefit our customers like never before. 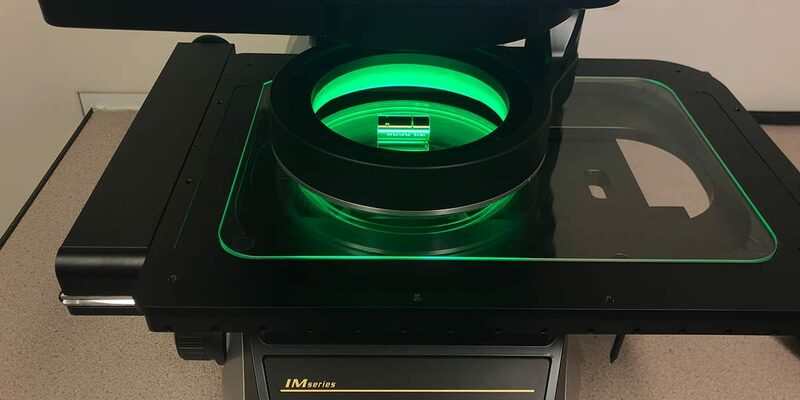 This top of the range Image Dimension Measurement system has allowed us to provide our customers with a more efficient service. Its sophisticated technology allows us to reduce inspection times, whilst also ensuring we don’t compromise on the quality of our precision turned parts and CNC milled components. The Keyence IM-7030T has innovatively increased productivity by speeding up the inspection of the components. It has the ability to measure multiple parts in seconds, enabling us to spend more time on the production process itself. This ensures our customers are consistently and rapidly provided with products of an outstanding quality. Our improved inspection and production times provides us with a strict of rules to adhered to, thus avoiding any subjective elements which may hinder the overall process. Alongside our new measuring system, the 24/7 lights-out automation machining we have in place here at APT, guarantees that our customers’ orders are fulfilled quickly and produced to the highest quality and to your exact specifications. We’re dedicated to ensuring rapid delivery times and at highly competitive prices. In addition to this, we provide our customers with complete transparency and full traceability, giving you peace of mind and ultimate satisfaction. Our real time live data capture system syncs with the barcode on each production run job sheet, constantly auditing the efficiency of our subcontract CNC machines. In turn, this reduces the time we spend changing tools and dealing with occasional breakdowns of our machinery, cutting our production times down even further. We’re also highly equipped to take blanket orders over a 12-month interval, enabling us to offer our customers a first-class service. Furthermore, it allows the flexibility and ease of calling off components as and when you require it. Our ethos has always been to invest in the most sophisticated, modern equipment, software and machinery available. Their maintenance and performance have always been of fundamental importance to us here at APT, allowing us to provide our customers with excellent products and services. The support we receive from both production and technical managers, together with the specialist knowledge of our team, ensures all components are of outstanding quality every time. For more information about the services we offer, don’t hesitate to get in touch with us – we’re always more than happy to help and discuss new challenges and projects.